Practically every fiddle player dreams of being able to play by ear. What does playing by ear mean? It means playing without reading music. To play by ear, you need to know a little bit about three things: 1) Simple scales, 2) Chords, 3) Walk-ups and Walk-downs. 1) Simple scales. This is the doe ra mi you learned as a kid. In the key of G, it’s do=G, ra=A, mi=B, fa=C, so=D, la=E, ti=F#, do=G. As you can see, you start with G and go right up the alphabet – G, A, B, C, D, E, F#, G. (For a G scale, you’ll use an F# instead of a plain ole F.) That’s not so complicated, is it? 2) Chords consist mainly of three notes that harmonize with each other. Major chords are made up of the 1st, 3rd and 5th note of a scale. Don’t panic! Let me explain. If we give each note of a G scale a number, it would be G=1, A=2, B=3, C=4, D=5, E=6, F#=7, G=8. So the 1st, 3rd and 5th notes of the G scale would be G, B and D. Correct? These three notes are called chord tones. 3) Walk-ups are like stairs that walk UP to higher chord tone. Walk-downs are stairs that walk DOWN to a lower chord tone. Secret #1: The first note of any melody will start on one of the three chord tones of whatever the chord is. For a G chord, the melody will either be a G, a B or a D. For a C chord it will be C, E or G. For a D your choices are D, F# or A. This is valuable information because to find the melody, you only have three choice. Three. That’s it! Secret #2: The second note of a melody will be a repeat of the first note, or it will either be a Walk Up the scale, or a Walk DOWN the scale. After several walk-ups or walk downs, the melody will land on one of the three chord tones of whatever the new chord is. So finding the melody is like playing a game of hop scotch. You jump from one chord tone to another, sometimes using a few notes of the scale in between. Below is my attempt to illustrate the anatomy of a melody, using “This Land is Your Land” by Woody Guthrie. Start by orienting yourself by looking at the words at the bottom. The four words in capital letters show you where the chord changes are. The song starts on G, goes to C, back to G, then goes to D and back to G.
The melody hop-scotches from one of the G chord tones to one of the C chord tones. and so on. In between each chord tones is either a walk-up or a walk-down. There are, of course, many melodies that don’t follow these simple rules. However, you can count on the fact that when you change to a new chord, the melody WILL generally be one of the chord tones of that chord. The notes in between the chord tones may jump around, but they’re always either a walk up or a walk down to one of the three chord tones. 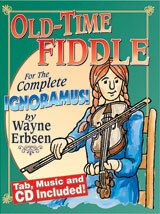 For more secrets of playing the fiddle, grab a hold of Wayne Erbsen’s book, Old-Time Fiddle for the Complete Ignoramus! See why this book is the most popular fiddle instruction book in America.